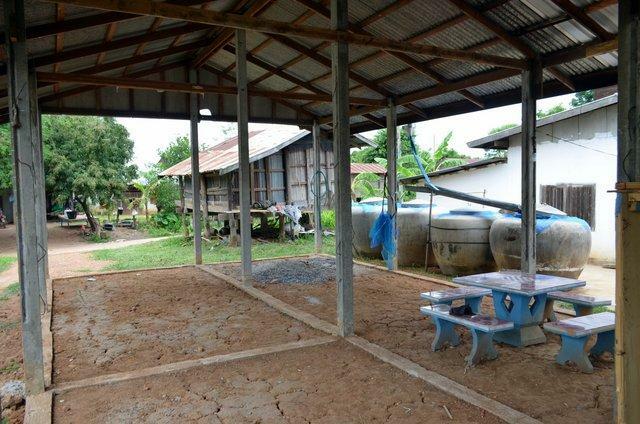 We already have a communal well which feeds into the house piping, but it's not drinking quality, often gets muddy and is dry during summer. We also have 2 drinking water tanks (one piped into the kitchen) which supply enough all year round and some for the neighbours as well. This is collected rain from the roof. 2 years ago, the local council financed a public water supply "nam papa", running from the nearest reservoir - great! 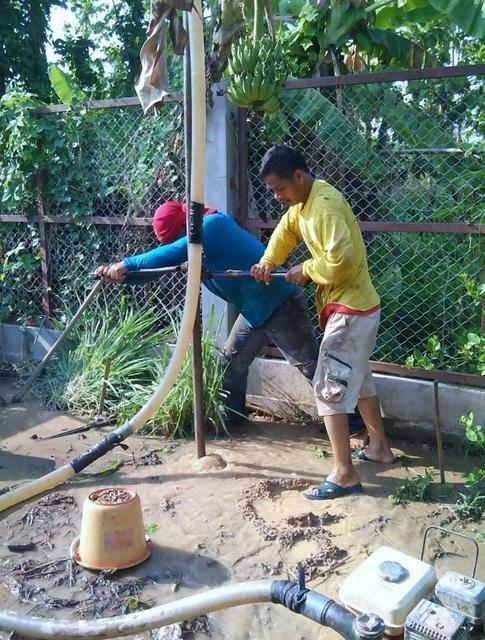 Unfortunately, the turn off the supply when water levels get low, which -you've guessed it, happens during the hot season at the same time the communal well dries out. What to do? The missus has been busy with her new business venture of growing veges ('business' in the wider sense, at least it keeps her occupied), and of course the approaching catastrophe of not having enough water needs to be averted. Last edited by stroller; 25-04-2015 at 09:06 PM. Check your roof size and average yearly rainfall and calculate how much rainwater you can collect per annum and build an underground cistern to size.. So she got a well-driller who came highly recommened, to test, i.e. 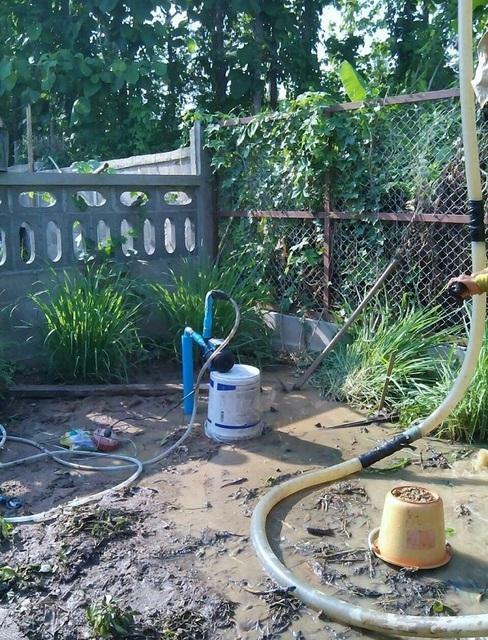 drill a few holes in the garden, if there's any water. If negative, the test would cost 600bt, if water found, 7000bt to lay a pipe down, supply a pump and install it. First time lucky, at 5 meters down. The rest is up to us, that is for the BIL to do and me to pay. All I can suggest is more storage capacity. 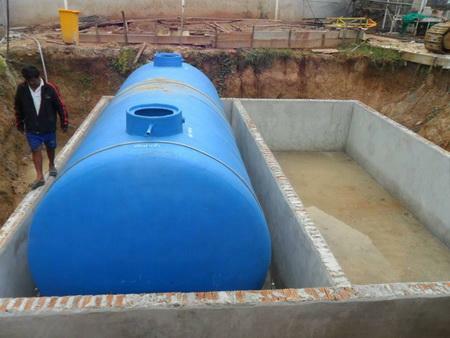 Fill up to capacity from the well and nam papa during the wet season. I've seen some big ones. Some made from concrete. Some like below. Run the water through a filter prior to the tank to remove sediment. That works as well. All a matter of more storage. 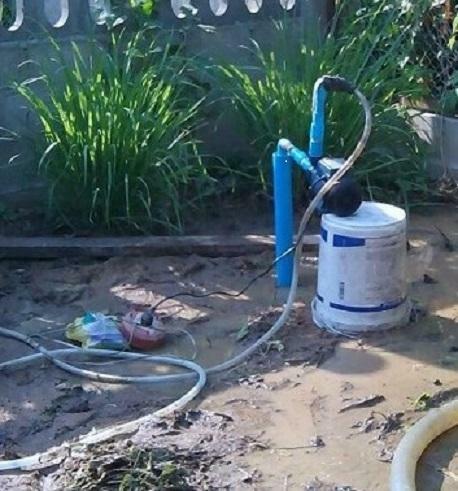 We've opted for the cheaper and faster solution for now, remains to be seen if the new well will dry up, too. Norton advice is about the best, though make sure you have a fliter system for the sand if you have any in the water. Alternatively how about going right down and going beyond the rock, if any there, we got quoted 50,000 about three years ago. just because the council one runs dry don't mean yours will. Worth a try. 6k baht gamble that may work out fine. Any which way that you and the missus go, best of luck to ya! Seems as there is always water issues in the sticks in one form or another. Is the pump as carefully plugged in as mine? Nice. I like the creative use of recycled plastic for the pump support. ^^ Your using one of my buckets as a prop mate. Do you have a licence to do so and also do you have a licence to dig a well? Don't require permission nor licences in the bush. You know how that works, mate. I can honestly say times are changing and now subsidence is a huge concern. Best to apply for a licence, pay an annual fee for your well and life is good. Seriously though, all I think you've done is tap into the village supply and you will run dry at the same time the village does, unless you're upstream, then you may get an extra 20 minutes. Or, another option - about 10-15 of these [the giant variety] lovelies. Most still do.....without the angst. The call me "Eco-stroller, the treehugger". It's only borrowed, I'll hand it back to you next time in Patters. FFS Stroller. Book worm more likely and or stealth camera man! You ever looked in the bottom of one of them Jeff. They're fine for watering the garden, just make sure to keep the mozzies out.